Could you live without your smartphone? March 08, 2019, 2:06 p.m. Most Britons won’t have heard the term and yet many of us might well be suffering from it: nomophobia, the fear of being without our phones. 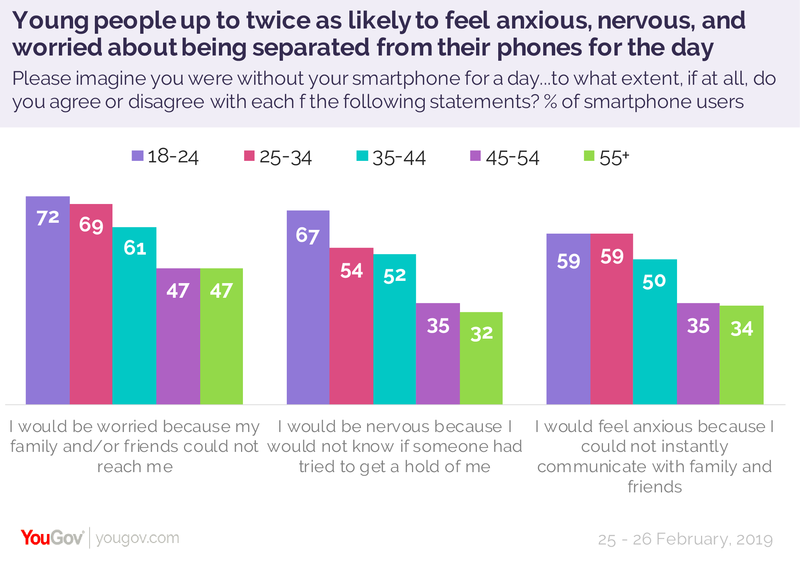 Nine out of ten Britons (88%) now own a smartphone, and new YouGov RealTime research reveals that a sizable proportion of them – rising to a majority among 18 to 34 year olds – would feel anxious, nervous or worried about being parted from their device for even a single day. But it also shows that they believe they’d be more able to focus on tasks and take in what’s going on around them. This anxiety is more prevalent among young people: 60% of 18 to 24 year olds and 25 to 34 year olds say they’d be anxious about not being able to communicate with family and friends without their phone, compared to only a third (34%) of those aged 55 and over. Conversely, three quarters (72%) of 18 to 24 year olds would worry about the fact that family and friends couldn&apos;t reach them, compared to almost half (47%) of those aged 55 and above. Two thirds of the youngest age group (67%) would be nervous because they wouldn&apos;t know whether people were trying to get hold of them, compared to a third (35%) of those aged 55 and over. 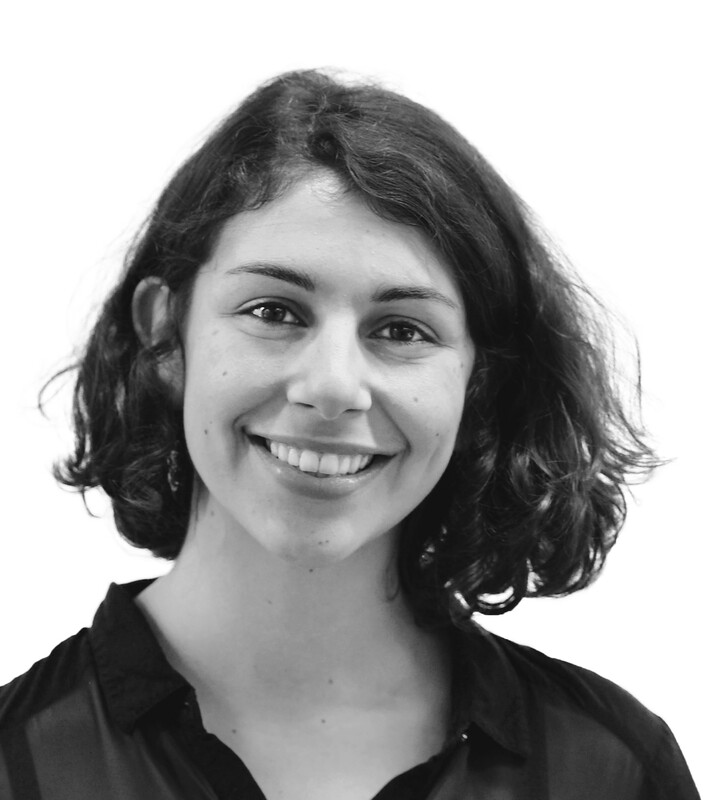 Women are also considerably more likely to feel anxious or worried about not being able to contact family and friends than men (52% versus 34%), not being reachable by family and friends (64%, versus 48% of men) or not knowing whether someone&apos;s trying to get hold of them (52%, versus 34% of men). One in nine smartphone users (11%) would be nervous about being &apos;disconnected from my online identity&apos; if they went without their phones for a day. This rises to one in five (19%) among 18 to 24 year olds and one in six (16%) 25 to 34 year olds. In perhaps the most revealing finding in regards to how much smartphones play a part in young people’s daily lives, just under half (45%) of 18 to 24 year olds say they’d feel &apos;weird because I would not know what to do&apos; without a phone for a day. A third (36%) of 25 to 34 year olds feel the same way, as do just one in ten (10%) of those aged 55 and over. 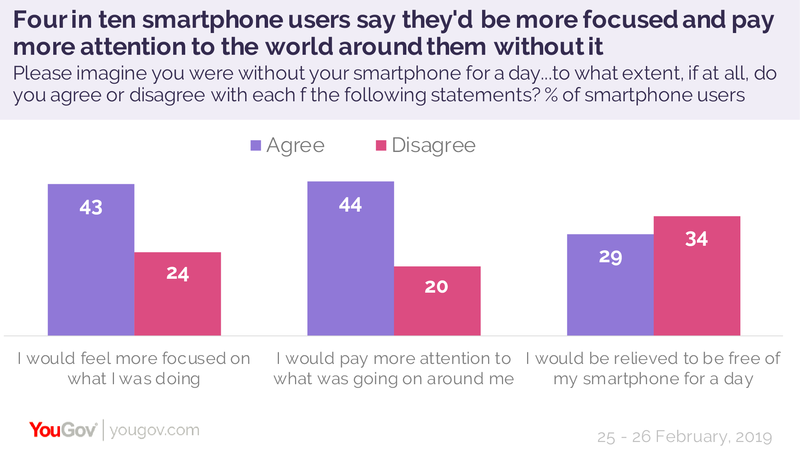 Smartphone users are significantly more likely to say they&apos;d feel more focused on what they were doing (43% agree, while 24% disagree) without their phone and that they&apos;d pay more attention to what was going on around them (49% agree, while 20% disagree). Young people are most likely to say they&apos;d feel more focused (56% of 18 to 24 year olds vs 31% of those aged 55 and over) and pay more attention to what was going on (63% of 18 to 24 year olds, versus 45% of those aged 55 and over). Despite this, when asked whether they&apos;d feel &apos;relieved&apos; to be free from their phones for a day, people were slightly more likely to disagree than agree (34% versus 29%). So how often does it happen that we&apos;re separated from our phone for a day – or even for an hour? Two thirds of smartphone users (67%) rarely or never leave home without it, rising to eight in ten (79%) 18 to 24 year olds. 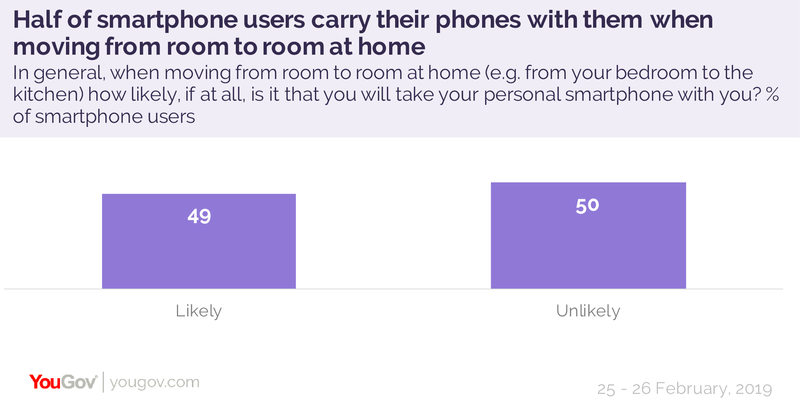 Even when moving from room to room in the house, half (49%) take their phone with them – again rising to eight in ten (78%) 18 to 24 year olds, seven in ten (68%) 25 to 34 year olds and six in ten (57%) of those aged from 35 to 44. Only among those aged 45 and above do a majority leave the phone in the room when moving around the house (59% of 45 to 54 year olds, 69% of those aged 55 and over). One in six smartphone users say it would make them uncomfortable to miss a day’s updates on social media.This rises to one in four (23%) among women. 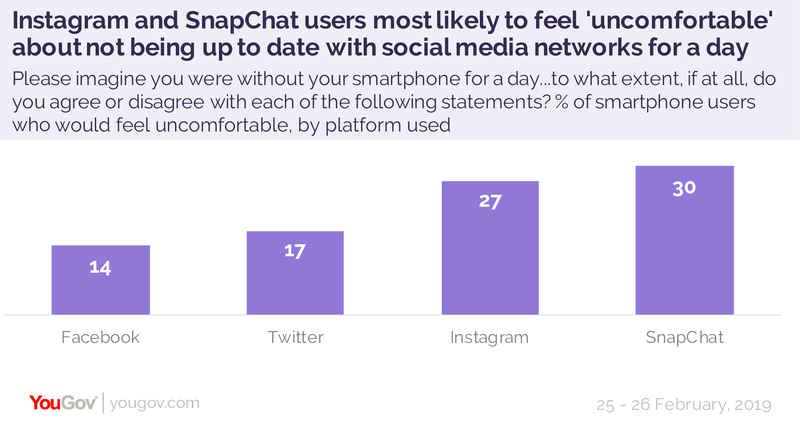 SnapChat and Instagram users are most likely to feel uncomfortable, at 30% and 27% respectively. This is to be expected given that users of these platforms tend to be younger, and 27% of 18 to 24 year olds reported that they’d feel uncomfortable going without social media access, compared to a national average of 15%. Twitter users were not far behind, with one in four (23%) saying they’d feel uncomfortable being away from their feed for a day. One in five smartphone users (19%) also said they&apos;d be anxious about not checking their emails for a day. For this survey YouGov ran an abridged version of a questionnaire developed by the University of Iowa which asked smartphone users how they’d feel about not having their phone by their side for 24 hours.